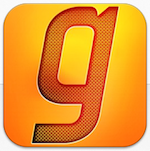 Gaana.com, the music streaming site from the stable of Times Internet Ltd (the digital arm of the Times of India group), has finally gone mobile (read it here) with the launch of its apps for all platforms. And it's about time as Dhingana and Saavn, other key players in this space, have already come up with their mobile apps and seen a million downloads each on Android alone. When you are playing songs, the album art for each number loads automatically. One can instantly 'favourite' it, add it to playlist, share it with others or turn it into a radio station with the help of the Radio mode and other options listed on the screen. The 'Info' tab on the player screen features various details about the song one is playing. Although social media integration and one-click sharing are available on other apps as well, this one also enables users to view the music history of friends and contacts. One can also add the songs on others' playlists to one's own with just one click. The home page displays top playlists and top songs, and on the top is a carousel, which shows the albums. The audio quality is fine, too, even on 2G. Users can discover music across different categories such as new releases, popular, artists, albums, genres and radio Gaana, or simply listen to what their friends are listening to. If you already have a Gaana account on the web, your content automatically syncs when you log into mobile and vice versa. 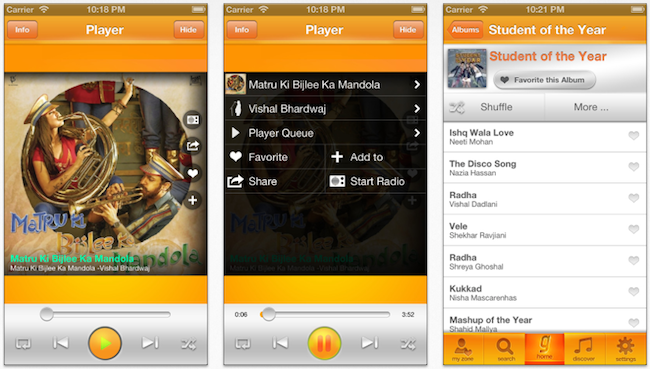 On the Android and iOS apps, songs are available in a number of languages including Hindi, English, Tamil, Telugu, Kannada, Malayalam, Bengali and Punjabi. Compared to Saavn and Dhingana, the Gaana app definitely looks clutter-free, as ads are not on display yet. Of course, there will be ad intrusions in the near future; so we may as well enjoy the clean and clear interface while it lasts. Although you can use the app without signing in, we suggest that you should sign in to enjoy all the features. After all, creating playlists, syncing those across the web and the mobile, or viewing what your friends are listening to will require signing in. The favourite playlists, songs, albums and artists are also displayed only if you are signed in. In addition, the app also saves your music history, which you can access only if you are signed in. Give it a try, explore all the options available there and let us know what you think.